"Digital Piano features that are important to me include a world-class sound, portability and a great action. All of these are covered with the Yamaha Digital Piano range. I'm comfortable performing live on a Yamaha knowing the sound will always be amazing." 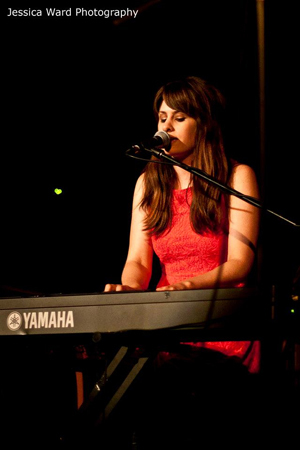 Gossling is the project of singer/songwriter Helen Croome. Her debut album 'Harvest of Gold' was released in late 2013 to positive reviews and a spot as Triple J's Album of the Week. It was later nominated for an ARIA, the Australian Music Prize and Melbourne Prize for Music. Local music lovers are no strangers to Gossling's mesmerising sound. There's her cover of Ou Est Le Swimming Pool's "Dance The Way I Feel" for Triple j's Like A Version; a duet with Oh Mercy's Alexander Gow for the Melodie Francaise compilation. TV fans of "Offspring" and "Gossip Girl" caught singles "Wild Love" (triple j's #18 most played of 2012) and "Heart Killer" on their small screens. There's guest appearances on "RocKwiz", slots at festivals such as Falls, Southbound, Peats Ridge, and West Coast Blues 'n Roots. And, of course, her spotlight-stealing vocals on the 4x platinum hit single by ARIA-winning hip-hop artist 360, "Boys Like You". Gossling has toured domestically as well as internationally, appearing at festivals such as SXSW and CMJ as well as touring through the UK and US. Along with writing for the Gossling project, Croome composes for other projects and artists, with the most recent release being a collaboration with up and coming songstress Vera Blue.